FILE - Mejury Tererai, 31, works in her maize field near Gokwe, Zimbabwe, May 20, 2015. Southern Africa has suffered one of its worst harvests in years due to a lack of rain, prompting concerns about food shortages across the region. Countries across Africa are looking to the United Nations climate change summit in Paris to urgently produce solutions to reverse the impacts of global warming on the world's water systems. In parts of southern Africa, a combination of heat waves and drought — a result of the El Niño weather phenomenon — have hit Zimbabwe and South Africa. "You have a massive drought, running short of drinking water, lack of rainfall," said Ngqabutho Mabhena, head of the Zimbabwe Community in South Africa. "We have run out of grazing land for the animals. Animals are dying in numbers. These are all the effects of climate change in Zimbabwe." In South Africa, the consequences of climate change have been dire as well. The country is quickly running out of water and a number of its provinces have been declared drought disaster areas, threatening food security in the country. Edna Molewa, the country's minister for Water and Environmental Affairs, says her government is doing what it can to fight global warming, including assessing the short- and long-term impacts of climate change on the country. "[The] government's response is taking many forms," Molewa said. "In this case, we have a climate response policy that's solid in place, and then we also look at issues of research." Global temperatures in 2015 are expected to be the hottest ever recorded, according to the United Nations World Meteorological Organization. FILE - Newly-built houses on the bank of the River Kaduna are seen in flood waters after hours of rainfall in Kaduna, Nigeria, August 15, 2015. It says the effects of climate change have led to global temperature increases of 1 degree Celsius above the pre-industrial era. The U.N. wants to keep the global temperature from rising by more than 2 degrees Celsius. In Burundi, unusually heavy rains have been felt across the country, causing landslides that have led to deaths and damage to homes and infrastructure. 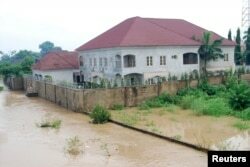 Nigeria also is experiencing unusually high rains. Ben Bem Goong, head of the country's environment ministry, says that seasonal rains have been earlier and heavier than expected. Alhassan Mohammed, an environmental scientist with the University of Abuja, says the effect has been extremely hard on those involved in the agriculture sector. "So, the effects mostly on those people that engage in agriculture is that the pattern they are used to, the rain pattern that determines when to plant and when to harvest, it has now been altered," Mohammed said. "There could be crop failures that would affect productivity, and invariably that would also affect their livelihood leading to increased poverty." Goong says the government is working to provide "a means of livelihood" for the affected communities in the Lake Chad Basin area, including dry season farming and possibly re-channeling water from other sources to the basin, which has shrunk to a quarter of its size over the past 20 years. 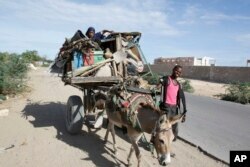 FILE - Somalis are seen leaving the Somali capital Mogadishu, due to hunger, for a refugee camp. Flooding — and the displacement and disease it brings — also remains a concern in Somalia, which is still dealing with the effects of a 20-year civil war. "We must collaborate with the international community, as we have no capacity to help our people alone," said Somali Deputy Health Minister Osman Mohamed Abdi. Some 3.2 million Somalis — roughly one-third of the population — were already in need of lifesaving aid and more than one million were internally displaced before the recent heavy rains and flash floods that came as a result of El Niño. Wassila Thiaw, the U.S. National Oceanic and Atmospheric Administration's Africa Desk chief, says surplus rains will bring flooding to parts of Somalia, Kenya and Tanzania for the next two months. He says, however, that dryness is expected in many parts of southern Africa including South Africa, Zimbabwe, southern Mozambique, western Botswana and northern Namibia. In Ethiopia, health ministry officials say climate change has contributed to recurring droughts in many parts of the country, as well as a re-emergence of diseases such as yellow fever, which has not been seen in the country in over 50 years. VOA's Central Africa, French to Africa, Hausa, Horn, Portuguese to Africa, Somali, Swahili and Zimbabwe services contributed to this report.